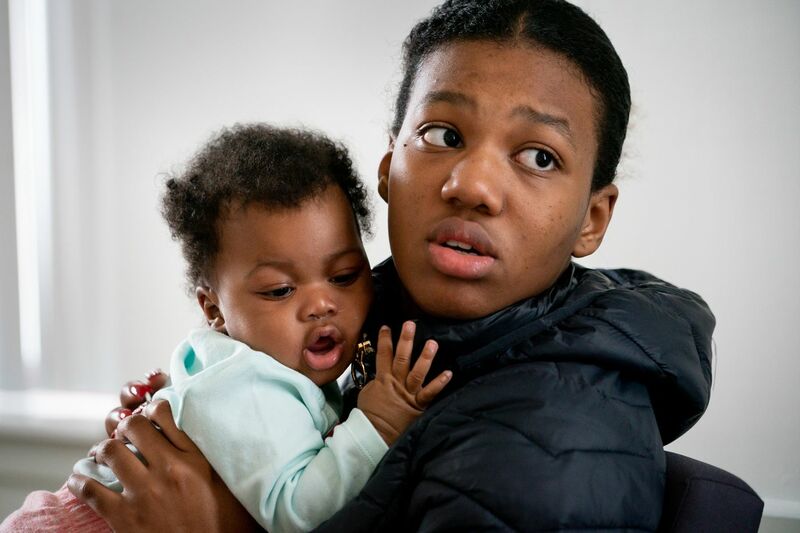 Chelsie Powell and her six-month-old daughter Sophia Powell, both of whom are homeless, meet with childhood development experts at the People's Emergency Center in West Philadelphia to discuss the importance of early childhood education. Six months old, Sophia babbles in her blue “I believe in unicorns" sweatshirt. Somehow, her mother, Chelsie Powell, 20, seems to understand what she’s chirping, and talks back, delighting the baby and inspiring more joyful noises. The enchanting near-conversation playing out in a West Philadelphia meeting room masks the tiny family’s swirling crisis. Powell is homeless. She lived in West Philadelphia for many years without her mother, and once was shot in the back in North Philadelphia. She came on this day to the People’s Emergency Center to save her daughter’s life. According to the four experts gathered in the room, it isn’t too late. For the last year, PEC has been working to foster the development of children up to age 5 who are experiencing homelessness in Philadelphia’s emergency and transitional homeless system. It’s called BELL, for Building Early Links for Learning, funded for nearly $1.5 million by Vanguard Strong Start for Kids, a charitable initiative of the Vanguard Group, an asset management firm, and its employees. The idea is to get young children who are living in shelters into early childhood education programs such as Early Head Start. Before BELL, there wasn’t a program that focused specifically on ensuring that homeless families with infants and toddlers were connecting to early child care, says Karen Pollack, vice president of programs with the Maternity Care Coalition, a regional nonprofit that helps pregnant women and young children. The coalition runs an Early Head Start program in South Philadelphia, as well as ones in Norristown and Pottstown. “If we’re not effectively responding to those children at that stage, it can have lifelong consequences,” Pollack says. According to child experts, early experiences of homelessness are associated with higher rates of developmental delays, poor academic achievement, asthma, attention problems, poor social and emotional functioning, acting out, and other difficulties. Along with speaking with homeless parents about getting their kids to early childhood education programs, BELL also informs shelters of the needs of children experiencing homelessness. When a family is in crisis and needs housing, the first priority is to get parent and child out of the cold, homeless advocates say. BELL personnel hold training and workshops on child development with shelter staffs to explain basics such as the importance of breast feeding or understanding how children respond to trauma. Shelter employees are asked to encourage parents to enroll children in early childhood education. The BELL program can’t force parents to take their children to child care, advocates say. The goal, then, is to educate families about the importance of programs such as Early Head Start. During 2018, BELL specialists met with the parents of 245 children living in 18 shelters, according to Roslyn Edwards, director of PEC’s early childhood education program. Cutuli says PEC doesn’t yet have data on how many of those children are now in early childhood education programs. But, he adds, the BELL program will continue to “spread knowledge,” and let parents and shelter workers understand the importance of early childhood education. Chelsie Powell says that she really wants to be a good mother. The lesson isn’t lost on Chelsie Powell, who recently learned that Sophia has been accepted into an Early Head Start program.